Recovering from this surgery is kicking my hind end in a way I hadn't expected. I cannot say much for being stuck in the house, resting when I don't want to be, and missing work. Yes, I actually want to head back to work and see if my little charge is walking. I miss Little Buddy when I go to long without seeing him. Anyway, I spent the day trying very hard to follow doctor's orders and not overdo it. Easier said than done. Refusing to sleep the day away in fear of completely throwing off my schedule, I decided to catch up on the reading I've not had time for as of late. I picked up Solsbury Hill and devoured it in a single afternoon. Eleanor Abbot is the main character, a 27 year old clothing designer living in New York City. She seems to have it all; an up and coming career, a steady boyfriend who has been her dearest friend since childhood, and just general happiness. We find that she deserves said happiness after being orphaned as a teenager. I must admit, the first pages of this book left me thinking Eleanor was a bit of a Mary Sue and her beau, Miles, became very much like a Ken doll in my mind. There was a point I nearly put it down, but I am so glad I kept reading. Eleanor is no Mary Sue and soon I was wanting to break Miles' knees. Anyway, a call in the night changes Eleanor's entire world. It is from a friend of her Aunt Alice, asking her to come to England as quickly as possible. Aunt Alice is dying and wants to see her. She agrees to go and in doing so sets off a series of events that will change everything Eleanor thinks she knows about herself. Eleanor makes the trip alone, the first thing she's ever done without Miles by her side, which is part of what I enjoyed about the book. I could very much relate to having the childhood sweetheart by your side through thick and thin then learning to do things independently. We see Eleanor grow as she reconnects with Alice and all those who live at her estate, Trent Hall. The family home becomes Eleanor's upon Alice's death and sadly the dear old woman departs leaving her niece with far more questions than answers. The ghost of Emily Bronte appears to help Eleanor put together her family's history and set right a so called "curse" on the women that share her bloodline. The book was inspired by Wuthering Heights and offers us a tale of what might have inspired that beloved classic. Ghosts, a handsome man named Mead, even Catherine and Heathcliff help weave a tale of tragedy, mystery, and romance as Eleanor explores her family's story and in doing so uncovers her own. Eleanor, Alice, and her friend Gwen were all well developed characters who came alive within the pages. I felt as if I was with them and could feel their emotions so strongly I fought tears several times. It was the same with Emily, her ghostly state, sadness, and determination to help Eleanor tugged at my heartstrings. Conversely, I felt the men were not nearly as well developed. I very much disliked Miles right form the start; he remained plastic with a fake smile for me throughout the book. Mead I found more appealing. He was certainly described as handsome, but as with Miles there was no emotional attachment or any of the things I want to feel toward a male lead. This left me disappointed. The book moved slow in places, but it wasn't so horrible I was rolling my eyes at it. There were instances that left me confused, such as Mead pulling a blanket over Eleanor's bare shoulders when she'd just said she was wearing a t-shirt. Neither thing left me overly bothered. That said, it may have been inspired by Wuthering Heights, but Solbury Hill cannot be compared to that novel and needs to be read and judged on it's own merit. I would absolutely recommend this novel. The thing that sold me on the story was the incredibly descriptive setting. No longer was I in the West Texas heat, but walking the windswept moors alongside Eleanor. Susan M. Wyler did such an amazing job laying the scene that I felt the chill of the wind, took in the scents of heather, leather, moss and damp earth. It absolutely felt like I was in Yorkshire experiencing everything with Eleanor. Even her dreams took me in with her, the whole tale unfolding like an unrolled tapestry in my mind. Wyler is such a gifted wordsmith that no only did she paint a picture of Trent Hall in my mind, but she brought it to life in such a vivid way that I could not only see, but experience it with all senses. It takes quite the storyteller to give a novel such life, but she managed it. 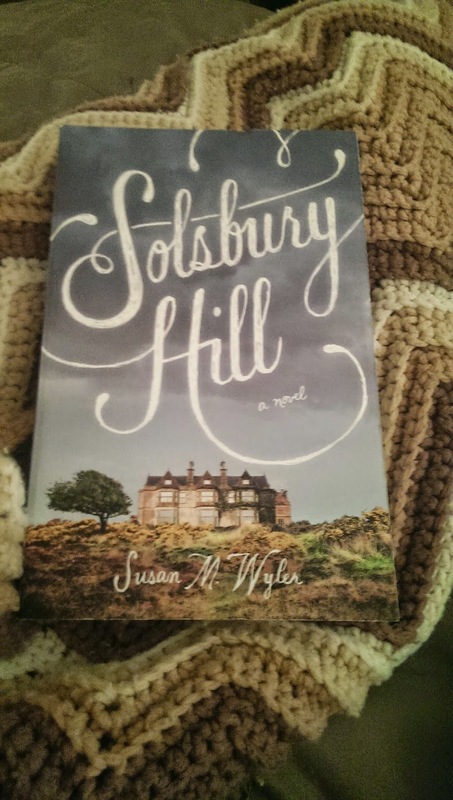 This is why I absolutely suggest Solsbury Hill be added to your TBR list. It is a great summer read. What a lovely review, thank you. It is amazing to read all the ways you took in the story, so deeply, understood it so completely. I am going to contemplate my men. It's not a surprise that the men would feel less real, not surprising to me. But it's my next great challenge.